Philip of Orléans (1 July 1336 at Vincennes – 1 September 1375 at Orléans) was a Duke of Orléans, Touraine, and Count of Valois, the fifth son of King Philip VI of France and his wife Joan the Lame. His father named him Duke of Orléans, a newly created duchy, in 1344. 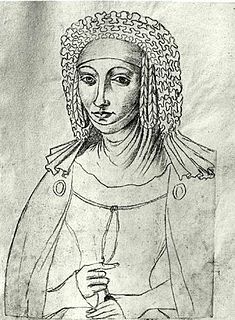 On 18 January 1345, he married his relative Blanche (1 April 1328 – 1392), the daughter of Charles IV the Fair and Jeanne d'Évreux, but they had no children. He had two natural sons, and one of them was Louis d'Orléans, who became bishop of Poitiers and bishop of Beauvais. A natural daughter, Marie d'Orléans, married Gédéon V of Beauvilliers. 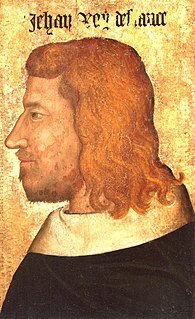 As a consequence of the Treaty of Brétigny he served some time as a hostage in England for the good behaviour of his brother John II of France, when he was temporarily released. Philip died in 1376 without any legitimate issue. His title and lands returned to the royal domain. ^ Tanya Suella Stabler, Now She is Martha, Now She is Mary: Beguine Communities in Medieval Paris (1250-1470), ProQuest, 2007, p 64. ^ a b c d Anselme de Sainte-Marie, Père (1726). Histoire généalogique et chronologique de la maison royale de France [Genealogical and chronological history of the royal house of France] (in French). 1 (3rd ed.). Paris: La compagnie des libraires. pp. 100–101. ^ a b c d e f Anselme 1726, pp. 83–87. ^ a b James I of Aragon (2010). The book of deeds of James I of Aragon: a translation of the medieval Catalan Llibre dels Fets. Crusade texts in translation. 10. Translated by Smith, Damian J; Buffery, Helena. Ashgate Publishing. p. 139. ISBN 9781409401506. ^ a b "MARIA d'Ungheria, regina di Sicilia". Dizionario Biografico degli Italiani (in Italian). 70. 2008. Gaston, Duke of Orléans, was the third son of King Henry IV of France and his wife Marie de' Medici. As a son of the king, he was born a Fils de France. He later acquired the title Duke of Orléans, by which he was generally known during his adulthood. As the eldest surviving brother of King Louis XIII, he was known at court by the traditional honorific Monsieur. Louis, Duke of Orléans was a member of the royal family of France, the House of Bourbon, and as such was a prince du sang. At his father's death, he became the First Prince of the Blood. Known as Louis le Pieux and also as Louis le Génovéfain, Louis was a pious, charitable and cultured prince, who took very little part in the politics of the time. The Duke of Orléans was the second son and fourth child of Henry IV of France and his Italian queen Marie de' Medici. Although he is commonly given the first name Nicolas or Nicolas Henri, he was never solemnly baptized and so never had a Christian name. Élisabeth Marguerite d'Orléans, known as Isabelle d'Orléans, was the Duchess of Alençon and, during her husband's lifetime, Duchess of Angoulême. She was a daughter of Gaston d'Orléans and a first cousin of Louis XIV of France. She has no descendants today. She was suo jure Duchess of Alençon and Angoulême. Jean Gaston d'Orléans, petit-fils de France, Duke of Valois was a French Prince and Grandson of France. He was a member of the House of Orléans.